Many people have asked what gear I carry with me in different situations so I decided to start a series of blogs to share what I use and a brief explanation of why. 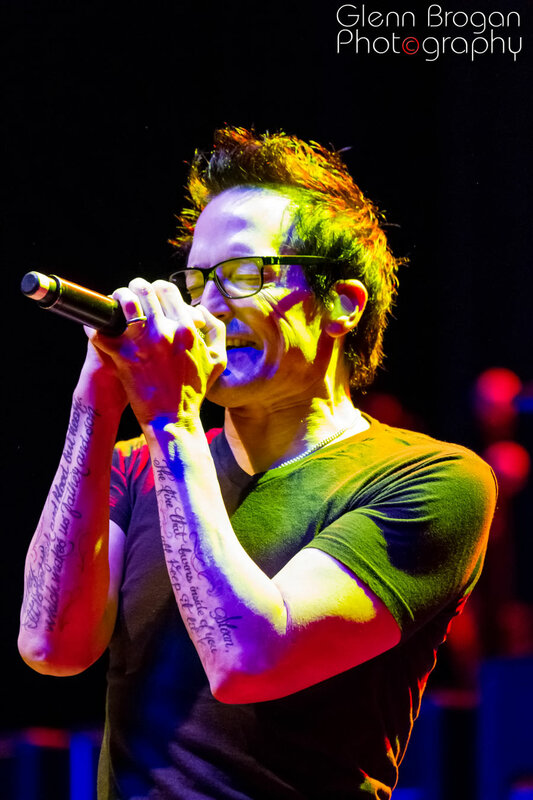 In this edition, I will share what equipment I use with Concert Photography. Canon 6D (full frame) camera body (with Battery Grip) – Used with all lenses below, INCLUDING the Sigma 18-35mm lens using a Kenko 1.5x extender to remove all vignetting. Canon 70D (crop sensor) camera body (with Battery Grip) – Used with all lenses below, but usually will have the Sigma 18-35mm f/1.8 mounted to start the night. Sigma 15mm f/2.8 lens – Can be used as a true fish-eye on the full frame body and as a 24mm on the crop body. Great for up-close shots from the photo pit! Sigma 18-35mm f/1.8 lens – The fastest zoom lens on the market with an f-stop of 1.8 through the entire zoom range. Primarily used on the crop body camera, but I will, if needed, use the Kenko 1.5x extender on the full frame camera for an effective 27-52.5 f/2.8 lens. Sigma 85mm f/1.4 lens – I love this lens from the pit or from the sound board. All around top lens used on both camera bodies. Some people shy away from a prime lens, but this is my favorite of this list. Sigma 120-300mm lens – When shooting from back of the room or soundboard, this lens is a MUST. Kenko 1.5x extender (not listed as an active product) – Used with Sigma 18-35mm lens on a full frame body. This is small, thin, and only adds one stop to a lens but gives 1.5x the distance of a lens! Using this with the crop body and a long lens from the back of a big room is a lifesaver for me! Manfrotto 695 Carbon Fiber Monopod – I only use the Monopod when I am using the Sigma 120-300 mm lens because it is very heavy. Arcatech Ballhead – The best head I’ve found to mount my camera/lens to the Monopod. PNY Elite Performance 64gb SDXC cards Fast and have not failed me yet! Q-Strap – Camera strap (Yes, I prefer this over the BlackRapid products)! I use this with the heavier of the 2 cameras I carry (based on which lens is mounted). Spider Holster This is used with the lighter of the 2 cameras that I carry (based on which lens is mounted). ProDot – Shutter Button Upgrade (Yes, they work!) Helps with shutter control. EarPeace Ear Plugs – High Fidelity Hearing Protection. B&R Folding Step Stool – Gives a height boost when shooting from behind or in crowd only (not for use in pit)! I painted the non-textured areas of this with glow-in-the-dark paint for my UV flashlight. Sigma branded lens Cloth – Performers love to throw water (and drinks) into the crowd. This is a necessity! Inova UV Microlight – A flashlight is helpful, but the bonus of UV comes into play with the painted step stool above. The UV light is not overpowering bright (that can get you yelled at by security), and the UV reacts with the glow-paint on the stool to eliminate tripping issues as people try to find their way in the dark. Credential Carabiner – This attaches to my belt loop. On it is a clear pouch for my photo credential, the UV flashlight, lens cloth, and EarPeace hearing protection case (see photo below). Many people have questioned my Camera body choices recently, quoting shutters-per-second and many other arguments, but my reasoning for the 6D and the 70D are a personal preference. Both bodies have WiFi built in, which makes sending instant proofs a major advantage ( I have to do something while waiting between bands anyways). The 6D is Full Frame, and therefore gives me a wider perspective with many standard lenses. The 70D is a crop body that is used mostly with the Sigma 18-35mm f/1.8 lens (which is the fastest zooming lens on the market currently). The controls on both cameras are very similar, which makes it easy to switch between the two seamlessly in the darkness. So there you have it, my gear essentials when shooting a concert. Maybe one day I will give details about how I shoot concerts and handle low light settings. 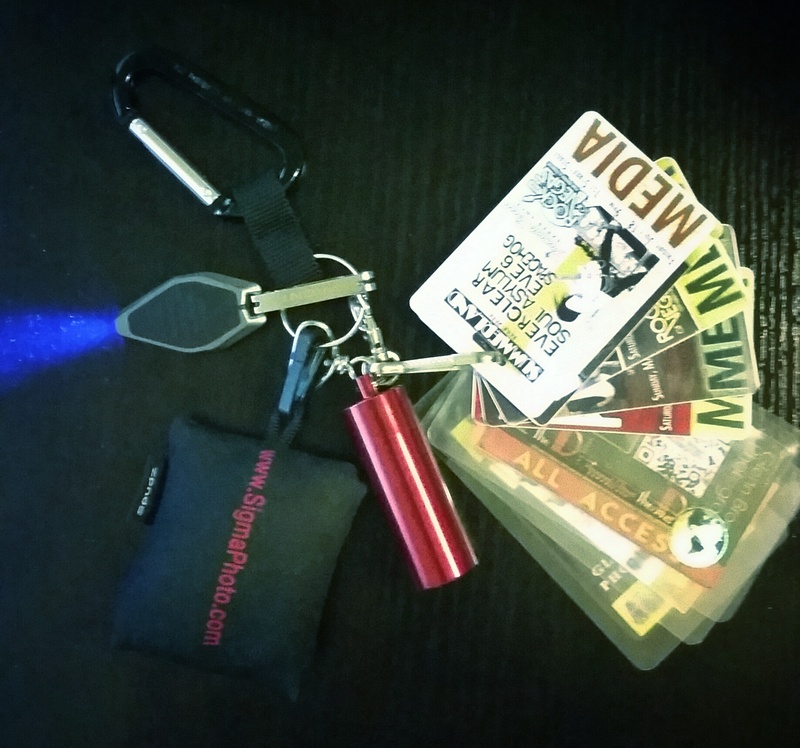 Carabiner, UV light, Media Credentials, EarPeace hearing protection case (red cylinder), and Sigma-branded cleaning cloth – all attached to my belt loop when at a show.